There’s a new dating service I want to share with you. It’s called Dream One Love. On their homepage, they write that the purpose of their site is to help you to meet thousands of European singles. Well, that’s kind of true. The site features thousands of single women. I’ve seen it with my own eyes. But are they all from Europe? It's easy to find women and the profiles reveal a lot. Dream One Love is a dating site that allows you tto meet European women. To be more precise, they female members are from Ukraine. It's free to join this site and it's also free to start chatting. In other words, the risk is low and the video chat function allows you to see that you are actually chatting with a woman. But that’s only one side of the coin. I mean, let’s face it. You don’t want to meet European women from Luxemburg, Germany, or Austria. Instead, you want to meet stunning Eastern European girls who look more beautiful than any of your friend’s girlfriends. So, is this site really about meeting women from Europe? Well, the truth (the surprisingly positive truth) is that this dating site focuses on female singles from Ukraine. Once you are on the homepage, you have to scroll down a bit to see the full picture. In my opinion, the owners of this dating site could have been a bit more precise and state this fact on the top of the homepage. Instead of writing “Meet Thousands of European Singles” they could have written “Meet Thousands of Ukrainian Singles” or at least “Meet Thousands of Eastern European Singles”. I mean, some guys who are actually looking for Ukrainian women might be reluctant to sign up because they have no idea where these “European women” come from. I’m sure this change could lead to more signups. Did I mention that it’s free to join this dating site? It is and I joined it. After I filled out my profile (more on that later), I had a look at some of the profiles on Dream One Love. What can I say? You can clearly see that the pictures were made by professional photographers. But you can also see that the women reveal quite a lot about themselves on their profile pages. They share their interests, their character, and the type of man they are looking for. However, I was still skeptical about the photoshopped images. I expected to be bombarded with fake messages. That’s why I waited. And I waited. And I waited a bit more. It didn’t happen. Eventually, one of the girls sent me a naturally that sounded quite natural. I was relieved. Before I share all the services with you, I want you to know something. I have spoken to the owners of this dating site. Apparently, they are working on a new feature that allows users to watch and speak with each other like in Skype. I’m sure this application will calm down a lot of sceptics who are afraid that they chat with Boris instead of Bella. You can’t just join this dating service for free. You can also chat with the girls for free. Okay, you can start to chat with them. You get one minute free each day. This allows you to have a chance to test the chat service without paying. Otherwise, you have to pay one coin per minute. The correspondence service allows you to write letters to the women on Dream One Love. It’s kind of like sending messages on Ukraine Date. It’s another name, but the principle is the same. You just have to click on a woman’s profile and look for the envelope sign on her profile. Sending one letter costs 10 coins. The voice chat, as the name already reveals, allows you to have phone conversation with one of the girls. Just like the chat itself, it costs one coin per minute. This is another great way to find out that you are actually talking to a woman and not to a man who pretends to be a woman. This feature is by far the best way to prove that you are talking to a beautiful Ukrainian woman and not to some dude trying to scam you. The video chat is live and allows you to see her, speak to her and to chat with her. 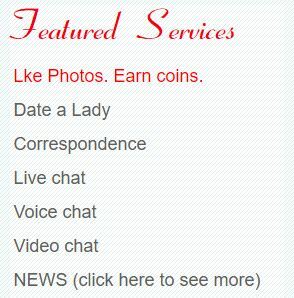 The bad news is that it costs an additional coin to every coin you already spend on chatting with her. The good news is that this feature should be even more awesome once the owners implement the “skype-like” function. Finding a woman on this dating site is pretty straightforward. All you have to do is to head over to your dashboard. There you see several pictures of beautiful female members in the upper middle of the screen. Don’t worry. You’ll find it. It’s impossible to miss. You click on one of the pictures (of course, you choose the girl you’re most attracted to) and then you will get redirected to her profile. From there you can start chatting. Well, first you have to go to the homepage. 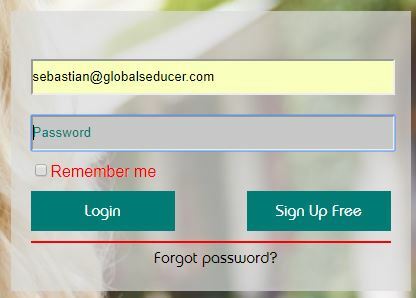 There you have to type in your email address and choose a password. Once you click the “Sign Up Free” button, you are ready for the next step. The system already has your email address and your password. But let’s be honest. No woman is searching for your email address. They want to see your name. You can either choose your real name or a username. It’s up to you. The only thing that’s not up to you is revealing your age. You have to be at least 18 years of age to use this dating site, which should be logical. Click that “Sign Up” button and continue to fill out your profile. 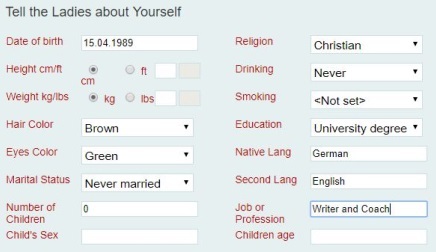 Now it’s time to fill out your profile. Let the ladies know that you are a religious, educated guy with brown hair and green eyes. Okay, that’s me. Your profile might look different. And that’s okay. Just make sure that you reveal the things that are important for a stranger who wants to get to know you. Reveal something about your character. Let her know that you are honest and direct. And don’t be as lazy as I was. Come on, I know that you can write a bit more than I wrote. Of course, it’s also important your future girlfriend has similar interests and hobbies as you. In fact, it is absolutely crucial. I mean, she doesn’t want to be with a guy who doesn’t like the things she likes and you probably see it the same way. And don’t forget to let the matching algorithm know what kind of woman you are looking for. You don’t want to get contacted by the wrong girls and miss out on the right girls. Now you just have to upload your profile picture and you are ready to get started. What about women who want to meet single international men? Then that’s not the right site for you. Check out my International Cupid review. There you can also find single men. if you want to meet Kenyan women, you have to check out my Kenyan Cupid review.